Masters of energy manipulation, these supreme beings seek to defend the cosmos at all costs. Adam Warlock was created by an enclave of scientists looking to build the perfect being as the future of humanity. Jack Kirby's intention was that the scientists were noble, but ended up creating a true Objectivist being who would not put up with their flaws, and so destroyed them; Stan Lee changed that so the scientists were secretly evil, and their new creation could sense that. Five years later, Roy Thomas and Gil Kane decided to turn him into a superhero version of Jesus, giving him his own Earth-like planet to save from his own Satan. Then came Jim Starlin, the godfather of all Marvel's "cosmic" books, who started in on the really trippy stuff. Warlock sat out the '80s, returning in time for Infinity Gauntlet, then spent a number of years being weirdly prominent in the Marvel U before returning to limbo. Since Adam Warlock is neither a big bruiser nor Spider-Man skinny, you can probably guess which body the toy is made of. He's wearing his traditional colors - red and black - but rather than his '90s costume, he's in the outfit he wore while he was a member of the Guardians of the Galaxy. 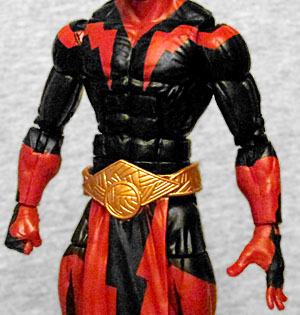 The lightning bolt shapes are a reference to the one on the chest of his '70s costume, and he has a loincloth hanging from an ornate golden belt sculpted with numerous lines all over the place. The paint is applied cleanly, though the black is already wearing off the wrist joints. No surprise there, I guess. 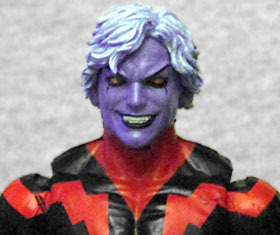 Unlike the last Adam Warlock figure, this one's skin is the proper color - orange enough to make even President Fuckhorn Muchango jealous! He has black circles around his eyes, and a black stripe on his chin. He no longer has the Soul Gem on his forehead, but he does get the floppy blonde Nikolaj Coster-Waldau hair, so it all works out okay. 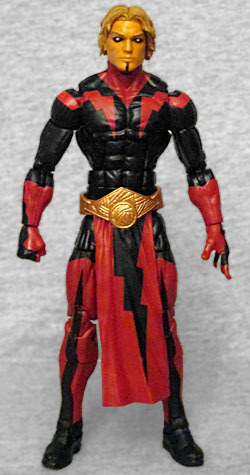 The figure comes with an alternate head, depicting The Magus. Originally Warlock's evil future self, then later a separate embodiment of the evil cast out of his soul, the latest Magus was the result of Warlock attempting to fix the timestream. In all incarnations, he has purple skin and white hair, though this one also gets red eyes and black lips. Since Warlock's costume covers everything from the neck down, Magus' head looks just as good on the body as the normal head does. Warlock has always had the usual combo platter of generic superpowers - strength, speed, durability, all that jazz - but the most recent version has also used "quantum magic" to manipulate energy in various ways. To represent that, the figure comes with a pair of light blue effects parts that fit on his wrists. It's hard to swap the one on the left hand, since the fingers there are all splayed out, unlike the right hand fist. A molding error on one of mine means it's missing part of its rings - that's fine, because the design of it keeps the mistake from being very blatant. 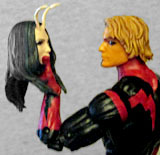 His piece of the series' Build-A-Figure is an important one: Mantis' head. That means this set has 300% the amount of heads as the average action figure! Adam Warlock is a messed-up, condradictory character, even by comicbook standards. Artificial human, spiritual savior, schizophrenic... the guy's had more interpretations than... some... thing... that gets... interpretted... a lot. Look, I can't land all the jokes, and most of my humor today was already used up ragging on Ex Nihilo. 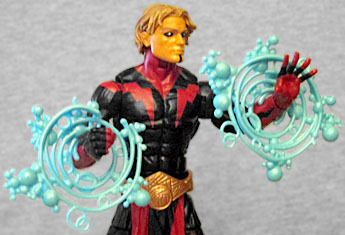 Adam Warlock is another of those figures Hasbro is releasing to make up for their past mistakes, and while he's not in my preferred costume, the toy is executed professionally.